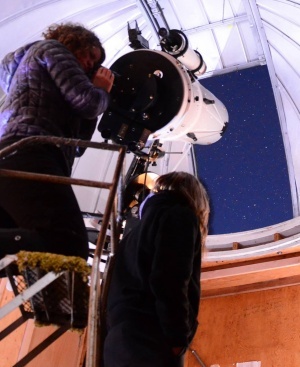 The University of Oregon’s Pine Mountain Observatory has been getting more attention lately, and if Scott Fisher’s plan comes to fruition, it’s just a hint of what’s to come for the facility high above the Central Oregon desert. Fisher will share exciting new research being conducted at Pine Mountain during a public talk at 6 p.m. Nov. 16 at UO Portland White Stag Block, 70 NW Couch St. He will also discuss some of the grand plans that lie ahead for the facility and highlight the many important findings undergraduates have contributed to at the observatory. Those planning to attend are asked to RSVP with John McGrath at mcgrathj@uoregon.edu. Upgrades to key equipment over the past couple of years have boosted the research Fisher and his team are conducting, which in turn has caught the eye of the scientific world. Suddenly, astronomers are calling Fisher about using the observatory’s telescopes to look at distant stars, asteroids and galaxies. 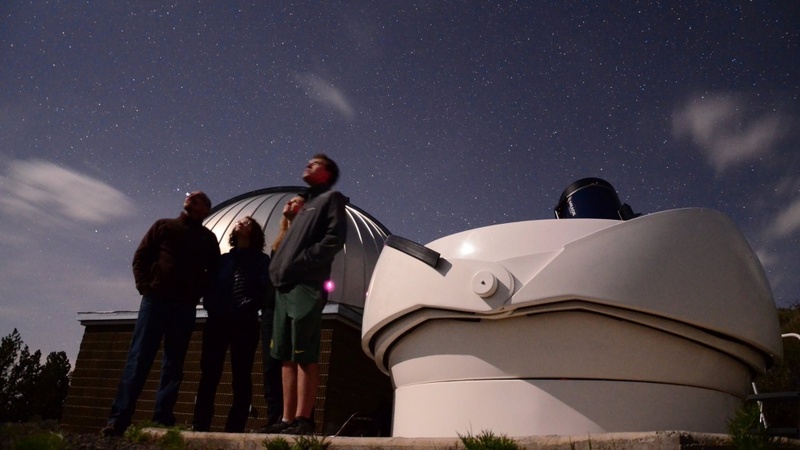 “I’m proud to say we are getting a little bit popular up there with our observatory,” said Fisher, a UO astrophysicist and one of the key figures behind Pine Mountain’s newfound attention. Fisher said researchers have been asking him about Pine Mountain because recent improvements have elevated it to a level where its capabilities can complement research being done at some of the biggest telescopes in the world. The largest gains at Pine Mountain have been to its 14-inch telescope — the smallest but most technologically advanced of the observatory’s four telescopes. Among those using Pine Mountain’s capabilities are Geoff Rhoads, a 1985 physics alumnus, and Ralph Shuping, a Portland-based astronomer working on a NASA-funded research project. Rhoads founded the Beaverton-based high-tech company Digimarc and is a longtime supporter of the university. His expertise is rooted in using data found in digital images in various ways, and his company’s technology is used by banking and publishing industries, among others. But he’s always felt the pull of astronomy, having spent time at Pine Mountain as an undergraduate. Three years ago, he connected with Fisher and told him about a fun side project to improve the quality of images of objects in space. Rhoads was specifically interested in photos of closely grouped pairs of stars called binary stars, which often appear as a single star because of their distance from Earth and from distortion as their light passes through the Earth’s atmosphere. His research could one day be used to improve images taken by ground-based telescopes around the world. Fisher offered the use of Pine Mountain, and Rhoads brought in an astronomy-grade camera capable of taking thousands of photos per second that he attached to Pine Mountain’s 24-inch telescope. Rhoads said the first images he saw from it were jaw-dropping. “It was just amazing,” Rhoads said of the photos that brought the farthest stars into a higher resolution than he imagined. He chips away at the project in his free time and goes up to Pine Mountain as much as his schedule allows. In the process, he’s become one the facility’s biggest boosters. The observatory has been a near-perfect fit for what Rhoads needs to carry out his research. He and Fisher envision providing more opportunities for undergraduates to participate in the work. Pine Mountain is also contributing to research on the formation of stars conducted by Shuping, a NASA-funded astronomer at the Space Science Institute. Shuping and his collaborators have been using the Stratospheric Observatory for Infrared Astronomy — a 9.2-foot telescope mounted in a 747 jumbo jet — to observe changes in the brightness of stars observed in the infrared part of the spectrum. Shuping realized that he and his team would greatly benefit from simultaneous ground-based observations of these young stars in visible light. “I knew that Fisher was ramping up the capabilities at Pine Mountain, and so I reached out to see if he and his team could help us out with these important observations for our project,” Shuping said. Fisher linked him up with Pine Mountain, and even though Shuping needed only a few looks at the young star, Fisher offered to regularly keep tabs on it as training for the students in his lab. In the end, the key beneficiaries are the undergraduates who contribute to and observe the groundbreaking research. Pine Mountain isn’t far from taking even bigger steps that Fisher said would further elevate its profile. The first is completing final upgrades to the facility’s internet connection, which would allow Fisher, his students or any astronomer around the world to control the 14-inch telescope remotely and look through it right from their own computer. The next would be to replace the 14-inch telescope, which sits on a state-of-the-art base and already has a top-notch camera.